217 Commonwealth is located on the north side of Commonwealth, between Exeter and Fairfield, with 215 Commonwealth to the east and 223 Commonwealth to the west. 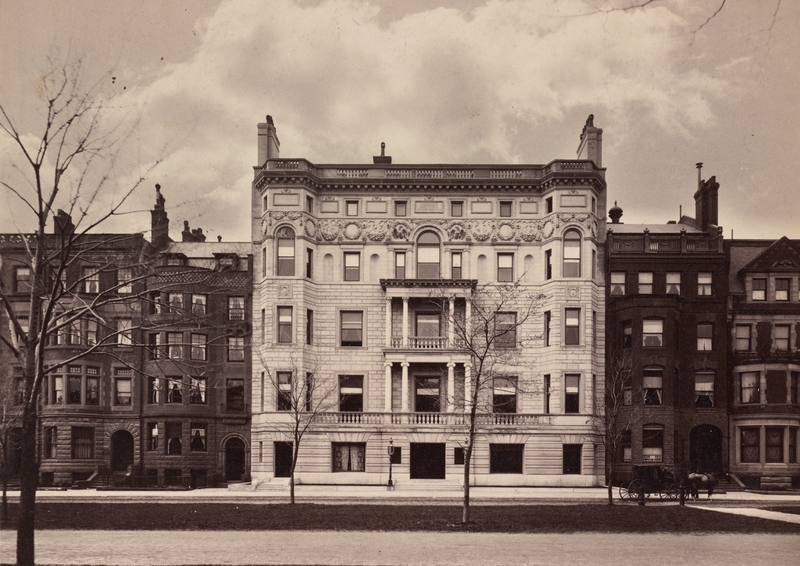 217 Commonwealth was designed by McKim, Mead, and White, architects, and built in 1887-1888 for the Algonquin Club. The new clubhouse was officially dedicated on November 8, 1888. The Club previously had been located at 164 Marlborough. The Club was built on a lot 82 feet wide composed of two lots, a 26 foot wide lot it purchased from Emily E. Sears on May 22, 1886, and a 56 foot wide lot purchased from Henry Lee on June 14. 1886. Emily Sears had acquired her lot on January 31, 1883, from James Lawrence, who had purchased it from the Commonwealth of Massachusetts on September 4, 1882. Henry Lee had acquired his lot directly from the Commonwealth on January 12, 1886. Click here for an index to the deeds for 217 Commonwealth. As originally built, the street level story projected across the entire front of the building, connecting the areas between the bays on the east and west ends of the building with the central portico. The street level was one story high, with balustrades above to create a balcony accessible from the first floor extending across the center of the building between the two flanking bays. 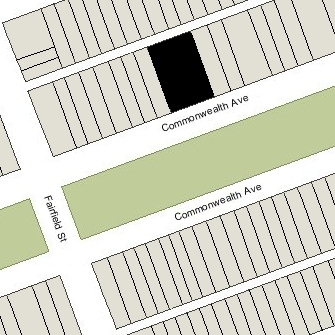 This street level plan was in violation of the restrictions contained in the deeds originally granted by the Commonwealth of Massachusetts, which required a twenty foot setback from Commonwealth Avenue, allowed only specified projections into that reserved area, and limited the width of bays which extended into the reserved area. In September of 1887, the Harbor and Land Commission informed the Club of this violation, but the Club proceeded to complete the building without change. In June of 1888, the Attorney General filed legal action to secure the Club’s compliance. 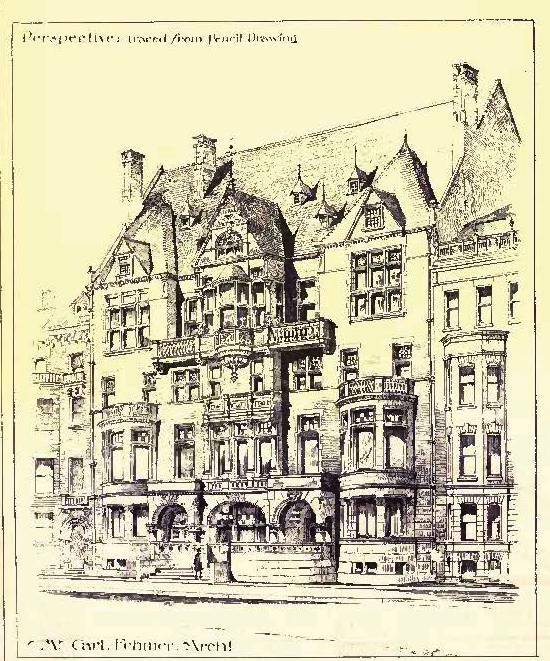 On September 15, 1898, the building was sold at auction to satisfy a $175,000 mortgage. General Charles Henry Taylor, owner of the Boston Globe, was the successful bidder, acting on behalf of a syndicate of club members. 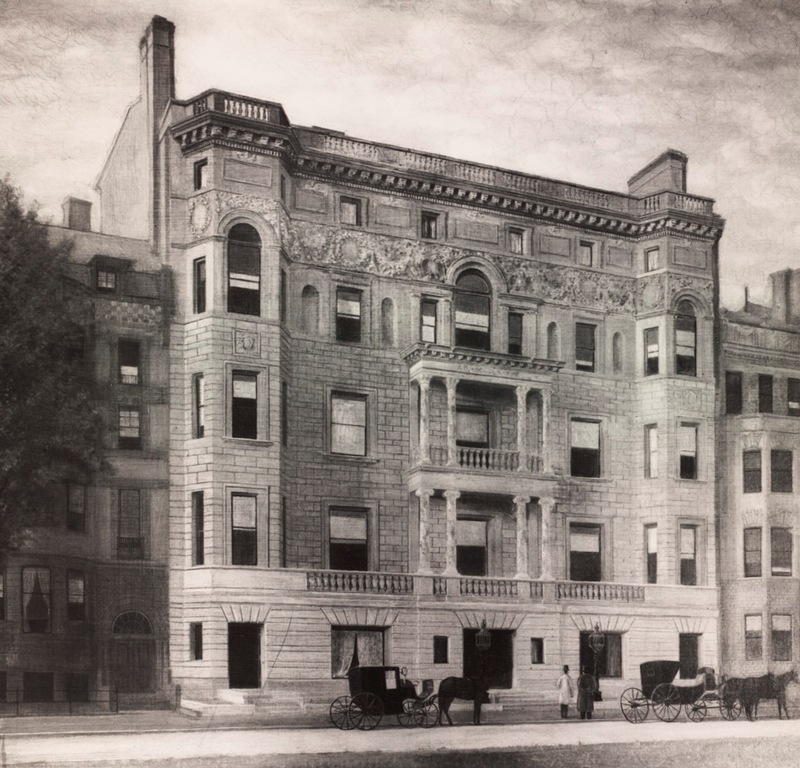 On October 13, 1898, the property was acquired by the New Algonquin Club. 217 Commonwealth remained the Algonquin Club in 2017. In January of 2018, the Algonquin Club’s executive committee voted to enter into an agreement to sell 217 Commonwealth to Hexagon Properties, which would renovate the building and continue to operate it as a private club. In August of 2017, Hexagon Properties had proposed converting Haddon Hall at 282 Berkeley (29 Commonwealth) – originally an apartment building and more recently converted into offices – into a private club. The proposal had met with significant opposition from neighboring residents, and in January of 2018, Hexagon Properties withdrew the proposal and announced plans to return the building to residential use. 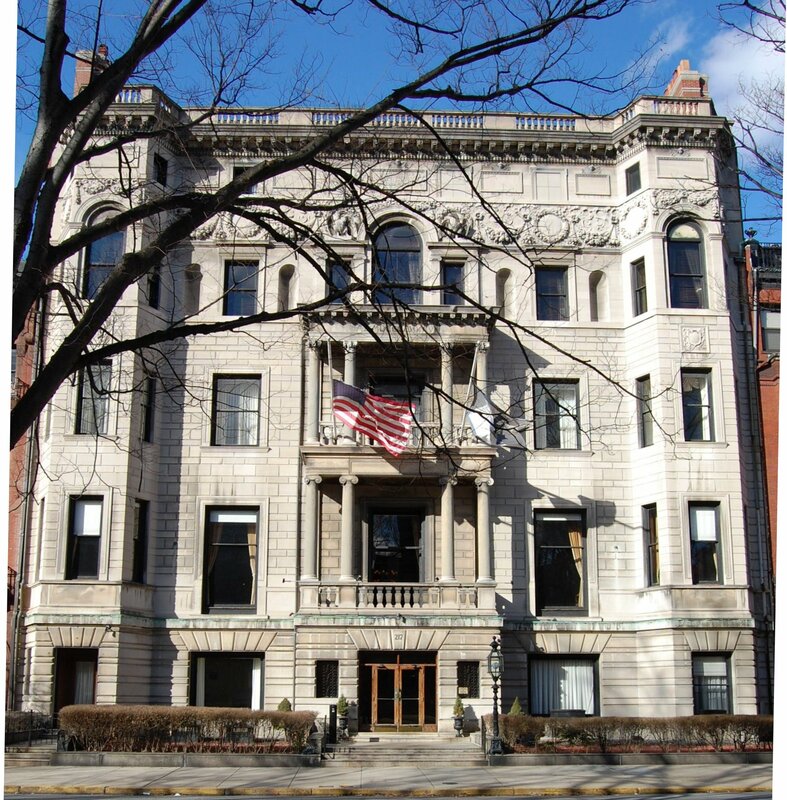 On February 27, 2018, the Algonquin Club members voted to ratify the agreement to sell 217 Commonwealth to Hexagon Properties. During 2018, Hexagon Properties applied for (and subsequently received) permission to continue operating 217 Commonwealth as a private club, including restoring the exterior façades, remodeling the interior to expand member facilities, and adding a roof deck. 217 Commonwealth, drawing from the “Inland Architect” (Jun1888); Inland Architect Collection, Ryerson and Burnham Libraries, The Art Institute of Chicago (Digital file # IA1203_0232).